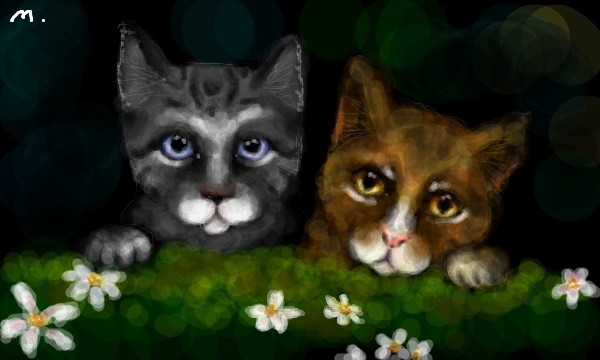 Leafpool And Jayfeather. . Wallpaper and background images in the Warriors (Novel Series) club tagged: jayfeather leafpool. This Warriors (Novel Series) fan art contains टॉम, बिलाव, टॉमकैट, बिल्ली का बच्चा, किटी, किट्टी, बिल्ली, सच्चे बिल्ली, and सच बिल्ली. There might also be बद गप्पी, बद गप्पी बिल्ली, टैब्बी, and टैबी बिल्ली. Just like Mothwing and Willowshine! I DON'T THINK THAT'S LEAFPOOL. I'M PRETTY SURE THATS MOTHWING/MOTHPAW/MOTH! LOL! I've heard it both ways Jayfeather and Leafpool,Mothwing and Willowshine but...*shrug*Its awesome I completely love it!! Its digi paint, like painter or photo shop. I made it on a site called sketchfu, if you like painting/drawing you should totally check it out. leafpool is stupid 4 trying 2 bcome a warrior..
i hate leafpool cuz SHE HAD KITS AND WASNT SUPPOSED TO!! I love forbidden relationships. The pic's cute. My fave forbidden relationship is probably Graystripe and Silverstream. It ticked off Firepoop so much I feel like laughing every time I think about how ticked off he was that his bestie Graystripe had a mate in RiverClan!